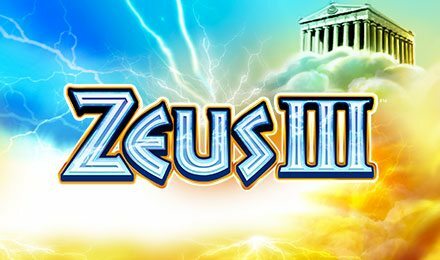 Play the electrifying Zeus 3 Slots and play for huge wins with an amazing 192 paylines! Command your throne like a Greek God and spin for major wins! Majorly serious chances to win at Zeus 3 Slots is no myth. With this electrifyingly exciting slot game that offers 6 regal reels and an unbelievable 192 paylines, you’ll find yourself cashing in on big winnings and shooting off celebratory lightning bolts as if you’re one of the Gods. Bonus symbols including Zeus, and his Lightning Feature symbol appear throughout, and spinning a full reel of only Zeus symbols makes it magically turn into a Wild Reel! Land on three or more Lightening Feature symbols and get a godly Free Spins Bonus!